A track-ready Jeep for the performance-minded driver. 2017 Jeep Grand Cherokee SRT. 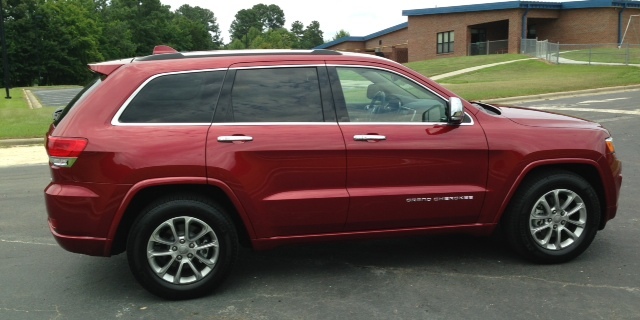 Think “Grand Cherokee” and all kinds of terms may come to mind. Premium SUV. Capable off-road navigator. Competent towing machine. We should add “road beast” to that list, especially when considering the specialty and high-end Grand Cherokee SRT. The SRT is not a new model as this writer spent ample time with the original, first presented in 2014. Now in its fourth year, this 475-horsepower example of track-capable prowess simply outperforms any Jeep built in the brand’s 75-year history. It is also the most expensive Jeep you can find anywhere with a starting price coming in at an eyebrow-raising $66,795. That’s $36,000 more than the base model, with additional amenities pushing your final cost even higher. Indeed, options such as the 19-speaker Harman Kardon audio system ($1,995), an interior wrapped in Laguna leather ($4,995), and a Trailer Tow Group Four package ($995) were among the features included on my test model. Add in the dual-pane panoramic sunroof ($2,095), high-performance Brembo brakes with red brake calipers ($1,295), and 20-inch lightweight forged wheels ($1,295) and your final price may top $80,000. Well, perhaps the price will come in closer to $77,000 when package discounts are included. Either way, what you have here is a Jeep that pushes into previously unchartered pricing territory. 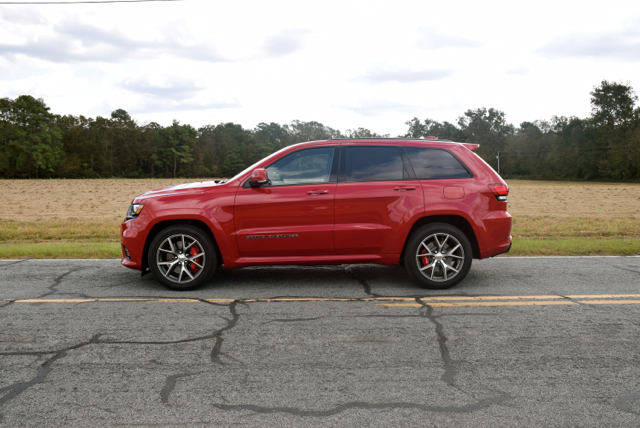 There are many things that set the SRT apart from all other Grand Cherokee models. The most obvious is the 6.4-liter HEMI V8 engine exclusive to this trim. Besides packing 475 horsepower, it has an output of 470 pound-feet of torque, and comes paired with an eight-speed automatic transmission and paddle shifters. 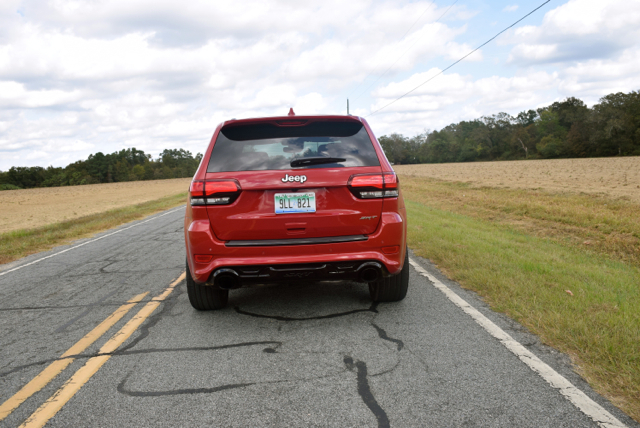 Jeep says the Grand Cherokee SRT has a 0-to-60 mph time of just 4.8 seconds as well as a 0-to-100-to-0 time of 16.3 seconds. Further, the SRT conquers the quarter-mile in the mid-13s range and has a top speed of 160 mph. Readers should know that this driver never pushed the SRT anywhere near the top speed capabilities this road beast offers. However, when it came to testing many of its other on-road antics, those features were pursued with glee. New for this year is an updated fascia, featuring an exclusive grille, fog lamps, and a unique leather package. 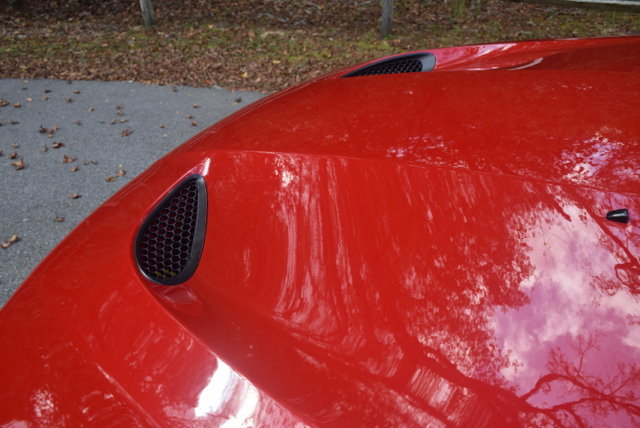 The expected blacked-out look is found across the upper and lower grilles, the fog lamp pockets, on the lower portion of the side mirrors, and on the rear diffuser with its extra large dual exhaust ports. The test model featured a Velvet Red Pearl finish, offering a handsome complement to the blacked-out look. Eight other color choices are available. Other exterior touches include gunmetal headlamp bezels, a unique hood with functional heat extractors, black roof molding, and fully polished 20-inch aluminum wheels in satin clear coat. The overall presentation is at once sporty and intimidating — you’ll know this is no ordinary SUV when you spot it in your rear mirror as it quickly approaches, then moves past you. 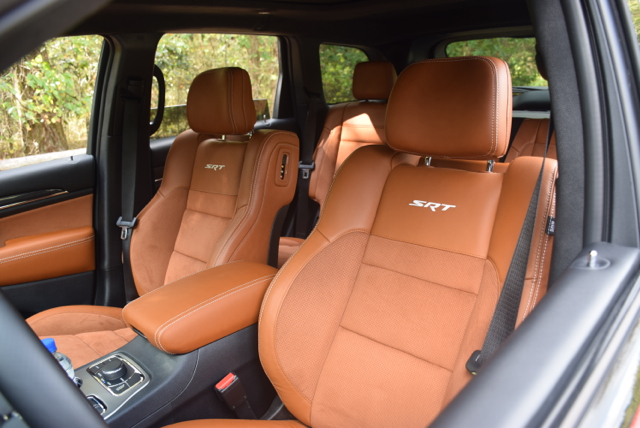 Inside, you’ll find other features unique to the SRT. Starting with the seats, the perforated leather-trimmed surfaces with suede inserts offer a fetching presentation. 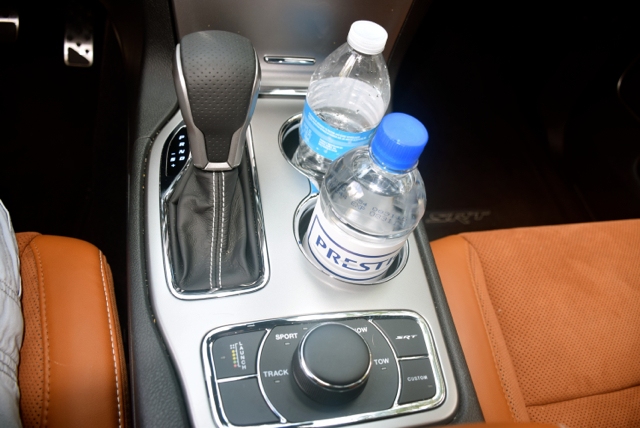 But with the optional perforated Laguna leather-trimmed seats, you see a prime example of what Jeep’s designers can do. The Laguna package covers the dashboard, the lower doors, and the front armrest/storage compartment. It is a type of high-end leather typically found in yachts and corporate jets. Yes, it is that beautiful to behold. And immensely comfortable too. Other standout interior features include a leather-wrapped, flat-bottomed steering wheel, a sporty instrument panel with overlapping dials, a generously portioned center console color display, and the drive select knob. Open-pore wood trim and brightwork trim are additional embellishments. That knob manages the SRT’s Selec-Trac system with five dynamic modes — automatic, sport, track, snow, and tow. Yes, this SUV is ready for track time as it is equipped with a higher-performance suspension with active damping — the better to maintain control when navigating tight turns or conquering the slalom. 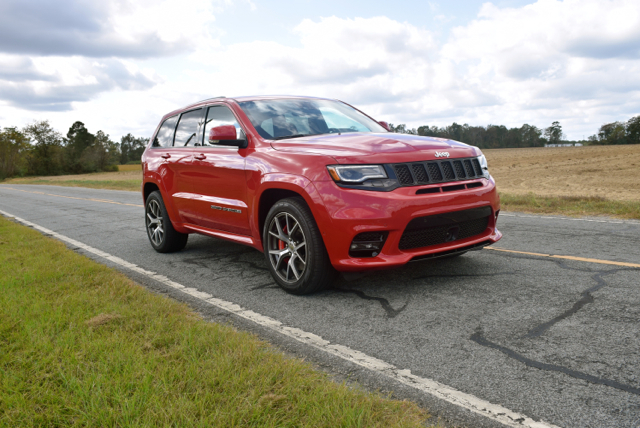 Whether you intend to take the SRT to the track or not, you’ll immediately understand that this is no ordinary SUV. Instead, the SRT strikes at the heart of the Porsche Cayenne, falling somewhere between the Cayenne Turbo and Cayenne S in performance, while costing thousands of dollars less than the competition. Press lightly on the gas pedal and the SRT purrs. Stomp hard and the engine bellows, the tires squeal, and you’ll find yourself pressed into the seat back. However, before you start, move the dial to sport mode and you’ll stay in gear longer and enjoy improved throttle response. When it comes to SUVs, tamping the brakes on twisty roads is a given — too much weight and body roll conspire to adversely impact steering and make handling a chore, while increasing the chance of a deadly rollover accident. But not so with the SRT — even though the feedback isn’t especially noteworthy, that this SUV stays planted much in the same way as a Charger or a Challenger is a fact worth amplifying. Credit grippy tires, superior damping, and a lowered stance for its superb driving and handling dynamics. If you can take the SRT out on the open road — or wherever it is both plausible and safe to let her rip — try the LAUNCH control feature. Press the “launch control” switch on selec-trac, followed by activating launch control, then launch RPM set-up. With your left foot on the brake and your right foot pressing the gas pedal all the way to the floor for wide-open throttle, hold it there until you’re cleared for launch. Then, remove your foot from the brake and the SRT moves forward at top speed. While the SRT is prepping to launch, the engine and transmission are immediately recalibrated to advance full launch. At the same time, the power spread is adjusted with 30 percent sent to the front wheels and 70 percent to the rear wheels. Under such potent conditions, you want this capable machine to stay fully planted. It is and it does. Investing in the SRT shows a commitment to a high level of performance. Of course, not everyone wants or can afford such an ambitious package. Instead, models powered by the standard 295-horsepower 3.6-liter V6 or the 3.0-liter turbodiesel (240 horsepower and 420 pound-feet of torque) will do. 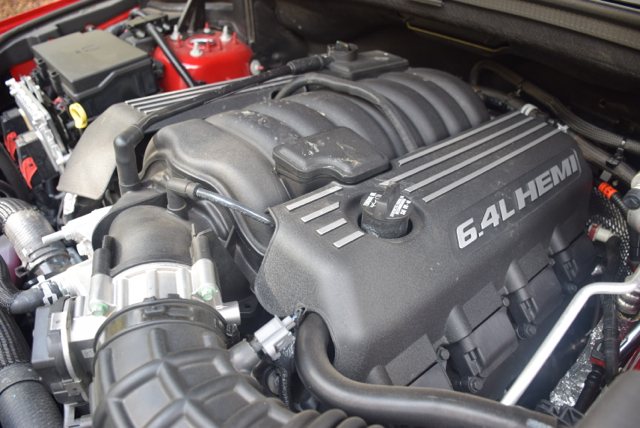 There’s also a 360-horsepower 5.7-liter HEMI V8 available on higher trim models and exclusive to 4×4 models. What about the long-rumored Grand Cherokee Hellcat model? Some have asked if this model will one day become a reality. I can tell you that the answer is no and yes. The “no” has to do with the naming convention. Fiat Chrysler ascribes “Hellcat” to Dodge models only — Charger and Challenger. When it comes to Jeep, the term “Trackhawk” will be used for models powered by the same 707-horsepower, 6.2-liter supercharged V8 engine found under every Hellcat’s hood. So, the answer is a resounding, if not qualified — YES! The Trackhawk’s arrival is scheduled for 2017 and will slot above the SRT in performance and likely in price. It is expected to precede the inevitable return of the still larger Grand Cherokee, Jeep’s answer to the Range Rover. To sum up, the 2017 Jeep Grand Cherokee SRT is everything performance drivers want. That is, if they desire an SUV. The SRT’s higher than a sedan or coupe profile is a big difference, but at least this model sits lower to the ground than other Grand Cherokees. Two compact Jeeps will be replaced by one new model in 2017. Is this the future Jeep pickup truck? The Jeep brand’s two smallest models slotted above the Renegade may reach the 2017 model year after all. The Jeep Compass and Patriot, compact SUVs introduced in 2007, will be built until Dec. 23, 2016. A Brazilian-manufactured replacement vehicle bearing one of the two model names will launch in 2017, according to Automotive News. The reprieve comes as Fiat Chrysler realigns its manufacturing base to build more SUVs. Both the Compass and the Patriot as well as the Dodge Dart are assembled in Belvidere, Illinois. All three models will be canceled or moved out to make way for the Jeep Cherokee. The Cherokee is currently built in Toledo, Ohio, but will be moved to Illinois in an effort to provide additional capacity for the next-generation Jeep Wrangler and a much anticipated Jeep pickup truck. 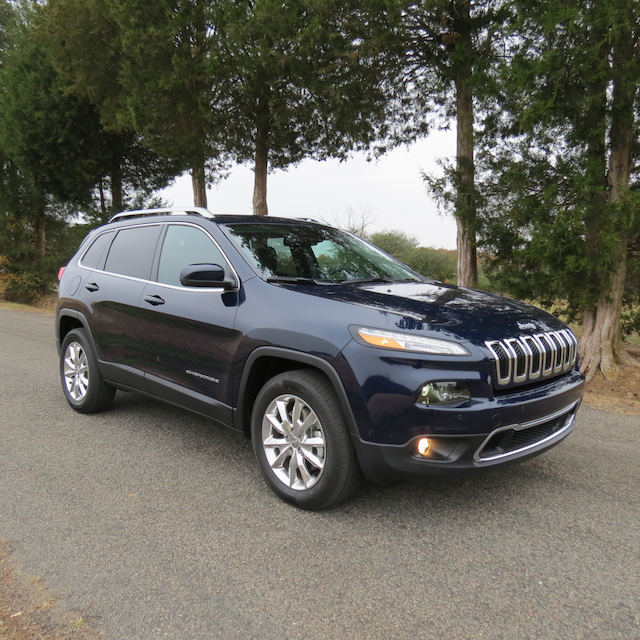 Following extensive retooling, Cherokee production is due to begin in May. The plant shuffling also extends to Sterling Heights, Michigan, where the Chrysler 200 midsize sedan is being built, but in modest numbers. FCA plans to lay off an entire shift of workers as it realigns Chrysler 200 production with demand. Sales of the 200 are down sharply over last year as consumers shift to pickup trucks and SUVs. By 2018, the Sterling Heights plant will begin making the next-generation Ram 1500 pickup truck. FCA is still looking for a partner to build the Chrysler 200 and Dodge Dart, models it says it no longer have priority in its portfolio. So far, no manufacturer has been identified as a potential partner. Eleven years is a long time for a model run and both the Compass and Patriot are showing their age. The two models were extensively updated in 2011 as part of a massive product overhaul conducted by the then Chrysler Group in advance of its merger with Fiat. Strong incentives coupled with increased interest by consumers in all matters of SUV have helped Patriot and Compass sales stay strong. 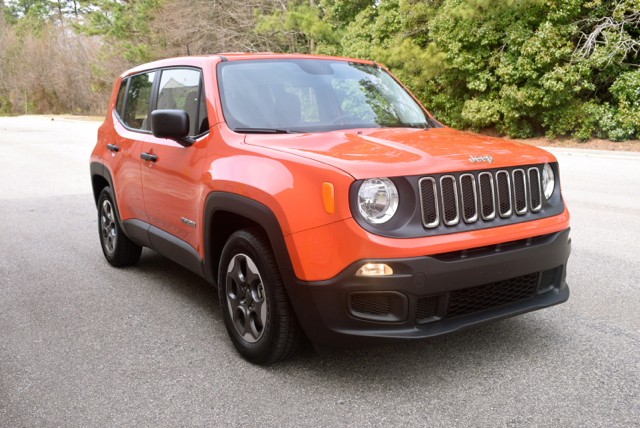 However, with new models above (Cherokee) and under (Renegade), customers have much better choices. FCA has two significant moneymakers in its Jeep and Ram brands. However, unlike Ram, Jeep is now a global brand and will continue to provide the most significant growth and drive the greatest profits for the automaker going forward. 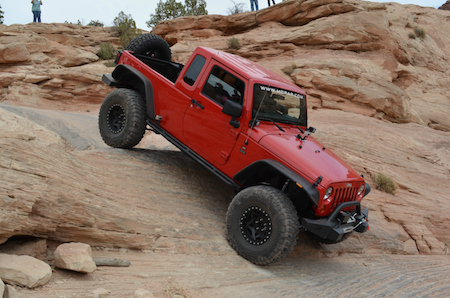 FCA is also holding down costs by building Jeep’s two smallest models overseas. Besides the Brazilian-built replacement for the Compass and Patriot, the entry-level Renegade is built in Italy. All other Jeep models are built in the US. Slotted above the Cherokee is the Grand Cherokee and in its own special category is the Jeep Wrangler, the only body-on-frame Jeep model presently built. In a Jan. 2016 update to FCA’s 2014-2018 business plan, the automaker noted that future “white-space” products are planned – Jeep Grand Wagoneer and Jeep pickup truck. The Grand Wagoneer name was last used in 1991, a model based on the Jeep Wagoneer, itself introduced in 1963. The original Wagoneer/Grand Wagoneer was based on Jeep’s full-size truck platform. Later Grand Wagoneer models incorporated features common to today’s SUVs, including a roof rack with rails, power bucket seats, leather surfaces, and upgraded sound systems. As for the new Grand Wagoneer we know it will be a three-row luxury model, based on the next-generation Grand Cherokee platform. Further, FCA has promised the grandest of all Jeeps will compete with Land Rover for luxury SUV shoppers. FCA will introduce the Grand Wagoneer to dealers only this August. As for the rest of us, expect the luxury Jeep’s global unveiling to take place in a major US auto show by early next year.